response from property - Feb 04, 2019 Thank you for the great review! So glad you are happy here, John! response from property - Dec 24, 2018 Kristin, thank you for your four star review! We are glad that you are enjoying your time here at Oak Terrace! Nice apartments to staysubmitted by Dhrumil S. - Dec 01, 2018 |Recommended: YesMaintenance people are friendly, silent community to stay peacefully. response from property - Dec 03, 2018 Thank you, Dhrumil, for your positive review! We are glad you are enjoying your time here at Oak Terrace! Nice quiet well kept complex.submitted by Chawndra C. - Jun 29, 2018 |Recommended: YesIt is great Staff is very welcoming. response from property - Jul 03, 2018 Thank you, Chawndra, for the great review! We are glad that you are happy here at Oak Terrace! Love it and plan to stay submitted by Tanya H. - Sep 12, 2016 |Recommended: YesI really like how friendly the staff is here. From the front office to the maintenance people they all work to make sure you are happy in your home. Its a quiet area and close to a lot of really great restaurants, grocery stores and fun things to do. I really like this place and plan to stay for a few years. response from property - Sep 14, 2016 Thank you for your kind words! We are thrilled to know you are happy with your new home at Oak Terrace Apartments. Homesubmitted by David D. - Aug 04, 2016 |Recommended: YesIt is good and somewhat quiet. It is a family orientated area. Not a good Apertment complex to live submitted by Hasan M. - Jun 02, 2016 |Recommended: NoAccommodation, Structure facilities is very poor according to the price. Buildings are very poorly maintained as over 40 years old structure. 1st always have water discharge from bathroom and kitchen ceiling. no in unit W D Hookup. laundry facility is horrible. most of the time machine are in not working status. Water bill is very very high in here. average 90 dollars per month. response from property - Jun 03, 2016 Thank you for your review and we are sorry of the perception of our community. We would like to discuss this further with you. If you have not already please stop by our front office so we may address your needs to the best of our ability. Conveniently by highway, friendly staff and maintenance.submitted by Sean G. - Apr 26, 2016 |Recommended: YesGreat area by the highway with friendly staff and very quick to respond for any maintenance inquiries. Love the website where you can pay rent online and see which washer and dryers are available. The landscape is great in some areas because there are plenty of grassy areas completed with a bench and a barbecue pit. I'm glad to have a little playground as my 3 year old loves the swing and slide. The only thing I cannot stand is the upkeep of the playground. The rocks they use for landscape has overwhelmed the area and makes it a safety hazard as the rocks are spilled between the slide and the swings. I cannot stand the sand they use under their swings. I probably would have preferred it more grassy minus the rocks, boulders and the very unsanitary sand. Other than that I like living here and would recommend this place to friends. response from property - Jun 03, 2016 Hello Sean, Thank you for your rating! 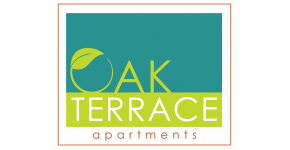 We appreciate all your feedback and would love to learn more about your experience here at Oak Terrace Apartments. It's nice.submitted by Javier S. - Apr 05, 2016 |Recommended: NoIt's nice and quiet and just off the highway for your convenience. I think the property is well maintained and very quietsubmitted by Michael M. - Feb 15, 2016 |Recommended: YesIt's like living amongst the trees in your own quiet little oasis.